In college I had the most unfriendly chemistry course. The course was self-teaching through cassette tapes that the students checked out of the Chemistry Room. If the student needed help, there was a Help Room available staffed by upper level and grad students, who may or may not be able to actually teach the material. Furthermore, the class was a procrastinator's nightmare because the point value of individual exams dropped the longer the student waited to take them. The requirement for my degree was that I go through three semesters in this fashion. After this experience, the last thing I felt about chemistry was fun and friendly. Surely there was a better way to teach chemistry! 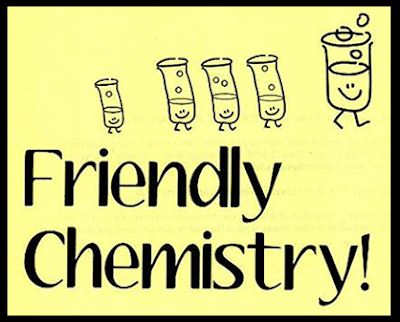 Friendly Chemistry, authored by Joey and Lisa Hajda, takes a completely different approach to learning chemistry. Friendly Chemistry is a basic level high school science curriculum specifically designed for groups. Included are a Teacher Edition, a Student Edition and manipulative set. There are 32 lessons, with each lesson taking about a week to complete. The Teacher Edition contains text for the teacher to cover with the students that presents what is to be learned in the activities and experiments that follow. Also included are chapter tests, tips and helps for teaching the lesson and preparation suggestions for the activities. The Student Edition acts as a combined textbook and workbook and contains reading material for the student as well as activity worksheets. You can view a sample of the Introduction and Lesson here. Retail cost for the Teacher's Edition is $60 and the Student Edition with manipulative set retails for $75. I will be sharing my first impressions now and follow up a bit later once my daughter has had the opportunity to go through more lessons. The very first thing I noticed was the incorporation of group games and activities into the lessons to teach the material. Having students move about and apply the concepts in creative ways only solidifies the concepts - and kids love it. I can completely envision this being a very successful curriculum for a homeschool classroom through a co-op. Who wouldn't want to learn chemistry through presenting a drama titled “Turmoil in the Chemistry Kingdom” to introduce ion formation? Physical games, board games, and activities, e.g. creating electrons with dough, playing Ion Bingo or baking atomic radius cakes - there is a lot of creativity injected learning chemistry. The labs in this program are equally fun and more along the lines of "kitchen labs". There are no hazardous chemicals or equipment required. At first glance, this is a curriculum that appears to be a diamond in the rough, mostly because of some of the organization and common challenges surrounding self-publishing. I would have liked to see the lessons and activities in the Student Edition also appear in the Teacher Edition. However, this would drive the cost up some. Despite some of the issues in presentation, the simple uniqueness of how the content is taught overrides the roughness. With a little polishing in the organization of the material and improvement in the presentation, some which has already taken place since the start of the review process, a real gem will emerge. I come with baggage of chemistry being taught in a manner completely opposite -dull, boring, non-interactive- as Friendly Chemistry. Friendly Chemistry uses an approach that appears very non-intimidating, approachable, fun....friendly! I will be using this curriculum with a single student that is junior high age, so check back later after we jump in for a closer look. In the meantime, please check out the Friendly Chemistry website. You can also read more reviews on this product by some of the other Crew members who have used Friendly Chemistry with a variety of students both in groups and within their homes at the TOS Crew Official Blog. Read an Part 2 of this review here. Up for giveaway today is a sample of the Paws and Tales audio CDs by Inside for Living. This CD contains Paws & Tales Episode 3, To Have and Give Not. Paws & Tales captivates minds and clutivates hearts with solid Bible teaching wrapped in teh laughter, fun and music of each episode! You can earn up to four entries! Make sure you leave a comment for each item. Sorry, only US residents are eligible. This giveaway will end on May 15th at 6 pm EST. Winner will be selected by random drawing. I actually had two of these, so there are two winners!